Cycling is a way of life. You see the World Differently on a bike. Berger Hardware Bikes is committed to bringing cycling as a way of life to as many people as humanly possible. We are equally passionate about cycling as a sport, as a mode of transportation, and as a recreation. We offer coaching/training and exercises prescription, as well as custom bicycle fitting and sales. In addition, BHB has a robust and active road and cyclecross team, based in Raleigh, NC but active in Austin, TX, Boston, MA and Ohio. The team races together, but also engages in community events to bring awareness to cycling. We also hold a variety of community events and races which are held regularly in Raleigh, NC. For the most up to date information, please check our Facebook. 2018 BHB Cross Central NC, A 10 Race series in the heart of NC! A total of 7out of the 8 races will be counted toward the BHB Cross Central NC Series. (1 race may be missed or lowest scores dropped). In the event of a tie, the highest placed rider at the Durham Cycles event (Series Finale) will be considered the winner. If a tie still exists, the winner will be determined according to USAC rules. 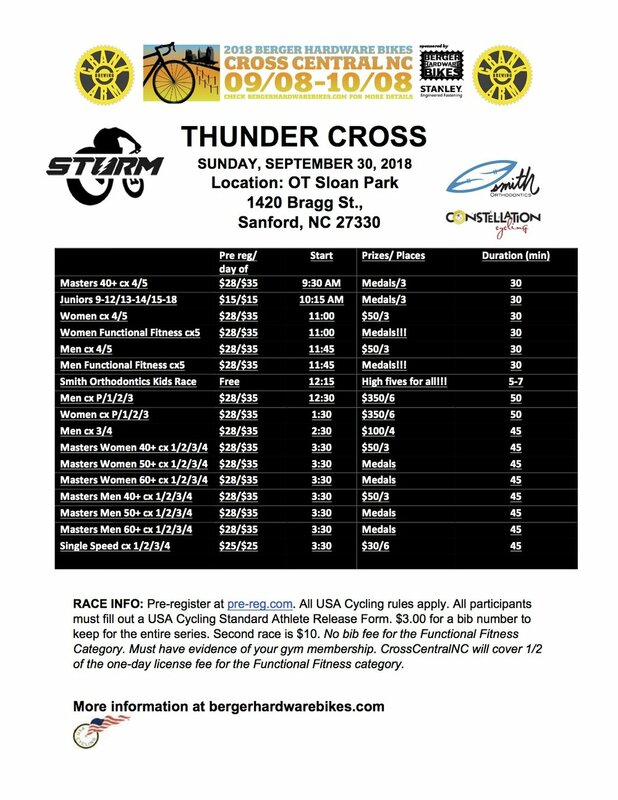 Riders must compete in at least 6 BHB Cross Central NC Series races to be eligible for the overall Cash and prizes and must be present at the final event to claim their winnings. Thanks in advance for coming out! $3.00 fee for numbers. Please keep them for the whole series. Replacement numbers are $3.00. Preregister for all the races on USA Cycling. There are buttons below. You know all those insta and FB pictures with your numbers pinned and bike all cleaned up and ready to race with the new tires and sparkly clean paint? Throw a couple of bucks and a few cans of food into the picture, post it with #racedayprep and then bring all those goods to the races to donate. Every race is a venue for giving back. Make grabbing a buck or two, or a couple of cans of food part of your race day prep ritual. This season we're collecting donations for The Ligon Food Ark Jr and the USCRI at every race. Let’s see what the cycling community can do for communities in need. PS: Remember your helmet, shoes, bike, water, air in your tires!! 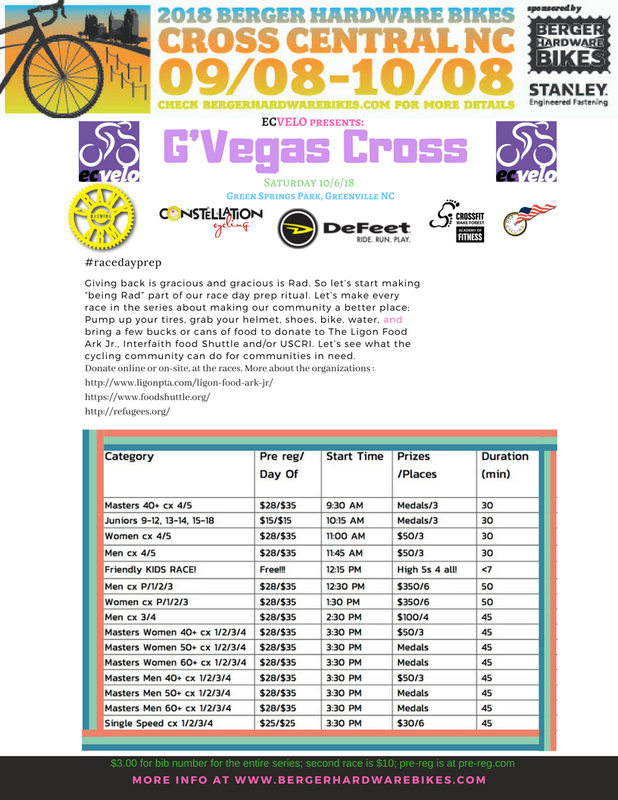 Registration for G’Vegas in Greenville NC and Durham Cyclocross are below!!! all the food donations from the first weekend of racing will being going to The Ligon Food Ark Jr.
Cross Country Running Race on The Course! SEE FLYER! Goldsboro Weekend Cancelled due to Hurricane Florence. Stay safe out there. Day of registration only. Cash or Check. No Late fee. Women CX 5 Functional Fitness* p/b CrossFit Wake Forest! day-of registration only. no late fee. Cross Central pays for 1/2 of your one-day license! Men CX 5 Functional Fitness* p/b CrossFit Wake Forest! *Functional Fitness Folks is for new, CX category 5 racers who are into going to the gym. Their race will start with the 4/5 race and be scored separately. They will be scored against the others in the CX 5 Functional Fitness category. The will also be scoredagainst the regular Cat 4/5 crowd. There is a category for Women and Men. This will be a USAC sanctioned event (all USAC rules apply), and look for details on our Facebook page for opportunities to come out and practice on the course. Cross Central NC will cover 1/2 of the one-day USAC license fee for any new racer that is a current gym membership holder, racing in the Functional Fitness Category! This series is designed as a fun and welcoming series catering to all types of racers. Most importantly Cross Central is designed as a relaxed but competitive race series with an encouraging and fun atmosphere that should cater well to the beginning racer that wants to try cyclocross racing. Beginners who may be considering racing cross but do not own a cyclocross specific bike are always welcome to use mountain bikes (without bar ends) and should find this a great series to find mentors and start a first race. If you are new to cyclocross and have any questions/concerns, please email us or reach out over social media.